Is this nuts? I’m looking for a corporate sponsor to pay for me to travel from Australia to Las Vegas, where I’ll hang out with 4,000 hot people, see the sights and generally enjoy five fun-filled days. But it gets worse. I actually think someone is going to pay for my trip because it makes good commercial sense. In fact, I think any business that doesn’t jump at this one-off opportunity needs a serious wake-up call. Why? Because it’s a unique, highly cost effective way to reach millions of people. Before you call the men in white coats and ask them to take me away, let me explain. There will be 4,000 bloggers at the BlogWorld Conference and Expo between 14 and 16 October. Read 4,000 smart, educated, affluent, interesting people, whose opinions are valued by their readers. Now let’s say each of those BlogWorld bloggers has 4,000 monthly readers. I’m being conservative, because some of the a-list bloggers who’ll be speaking have hundreds of thousands, and my blog has over 7,000 unique readers each month. But even with these conservative figures, 4,000 bloggers with 4,000 readers each means the story will reach 16,000,000 people. My maths isn’t great but that seems to be 16 million people. Not as many as the 105 million people who watched the Super Bowl this year, but it’s not to be sniffed at. Which Brand Wants to be a Hero? So how much would it cost to make this story a reality and reach those 16,000,000 people? Only US$5,000. If a company kindly sponsors me I’ll give them an exact breakdown of how the money will be spent, but this sum should cover return air fares, airport transfers, accommodation and conference fees. You can contact me by email annabelcandy at gmail dot com then we can talk about how we can make it work best for you, and how I can make sure you win from this too. Even if my benevolent sponsor only invests $5,000, it’s a pittance when you compare it to the advertising, marketing and PR budget for many big companies, plus it offers a great return on their investment in terms of brand recognition, strong public relations, link love and subliminal advertising. No one pays much attention to adverts or PR spin, but people do pay heed to their favourite bloggers. Nobody really. I’m just a mother, wife and writer who follows her dreams and likes helping other people follow theirs. I’m passionate about people, writing, travel and blogging. I think everyone should have a blog, especially creative personalities and small business owners, and now I’m using my masters degree and 15 years of Internet marketing, web design and writing experience to help other people succeed online and off. I also aim to make people more confident and motivated because these are issues I’ve struggled with in my life and still battle. Most of all I want my blog to be a place where people can hang out with other positive-thinking people who encourage and support each other. 1. Get In the Hot Spot has a small but perfectly formed, and highly engaged audience, who are predominantly well-educated and female. According to TweetReach my 50 latest tweets recently reached over 100,000 people. 2. I’ve got a proven track record of working with corporations and get people reading about them when they wouldn’t otherwise have done so. In May, Coca-Cola flew me to Shanghai business class for a social media conference. I mentioned it in seven posts on my blog, getting hundreds of reader comments and the story was featured on at least 9 other blogs including major blogs like The Personal Branding Blog, Max Blog Press and Brazen Careerist, the “#1 social network for Generation Y” with over 100,000 uniques per month. 3. Bloggers are a more effective way of spreading a message than other forms of advertising which jaded consumers have become blind to. 4. Bloggers do a great job inspiring and informing their readers and should be rewarded for that. I don’t get paid for my time writing except in regular comments and emails from readers thanking me for helping them. 5. Some companies treat bloggers as a commodity and this is your chance to show bloggers you’re fair and social media smart, and align yourself with a passionate blogger. If a company sponsors me I’ll donate all reader donations to Unesco to help with the Pakistan Flood. If enough money is donated ($5,000) and no company sponsors me I’ll go to BlogWorld and write about it here to share what I learnt with you. If I don’t get enough donations to go to BlogWorld and no one sponsors me I’ll use all the money donated to help entrepreneurs in developing countries by lending them the money through Kiva. This will be a great project for us to back and something I’ve been meaning to do anyway. Please click on the donation button at the bottom of this post and make a $25 donation (that’s my suggested amount, but you can donate more or less – however much you are able). Please help by sharing this story on Twitter, Facebook and anywhere else you can think of. If you know anyone who works at a big corporation, or in an ad or PR company, please email them the link and tell them the story. 1. You’d like to give back a little for the time I’ve put into this blog. 2. I’ve helped, motivated or inspired you and you’d like to repay me for that. 3. You’d like to help a good woman realize her dream. 4. You like to support an underdog. 5. You’d like to show people that little bloggers like us can do great things. 6. You want to help me grow my blog so I can carry on helping you realize your dreams. 7. You’re already going to BlogWorld and you’d like to meet me there. 9. You’d like to find out where this story leads to and you like stories with happy endings. 10. You think I’m a crazy fool who’ll never get to BlogWorld, but at least we’ll raise some money for Unesco or Kiva. If you’d like to receive these 10 benefits, your generous contribution would be appreciated. Just click on the button below to donate by Paypal or credit card. I’ll be writing about the outcome of all this soon. Thank you for reading and supporting me just by being here. Good luck on your adventure and drive for sponsor dollars to attend the show Annabel. For the record in 2009 our attendees had a combined monthly audience of over 180 million people. This year will far exceed that. Now it would be unreasonable to assume you will meet every single person at the show and get them to post about your sponsor but still the potential influence is very big. I hope you make it! I read about it on Twitter so hopefully word is spreading. Hi CommD, thanks so much for stopping by, leaving me a comment and wishing me luck:) You can but try! You had me in the beginning. Ballsy move to just go out and ask a corp. to sponsor your trip… I think it’s a great idea. But you lost me when you asked readers for donations. Sorry. Great..I do think someone will come around and donate that 5k..but I do thinks its going to be a big company..because 5k is a lot of money. Hi TC, thanks for commenting, it’s an interesting experiment and I’ll let you know what happens. I hope a big company will sponsor me so we can raise some money for charity, but they tend to have a lot of red tape involved so the time thing is probably a barrier. You’re right, it is a lot of money but I absolutely want to grow my blog and continue to do the work I’ve been doing here. I get regular emails from people thanking me for helping them and when my blog become a viable business I will continue to give back by donating money to charity. Ma chere Annabel, this is an extremely smart approach to getting sponsored, this is so well-written that it did not once turn me away or turn me off as messages like this usually do – because I know you and I know you would add so much value to the lucky company who sponsors you! You did not mention one thing: What if people donate and then it doesn’t reach $5000 and by some small chance, no sponsor shows? What use would you put the donation to? I wish you the best the very very best……I would LOVE to meet you at Blogworld and truly hope you can make it. Off to RT you! Of course you did – So sorry for not seeing that part. Can I blame jet lag? :)!! That is awfully kind of you _ I was hoping that you’d perhaps have projects for Get in the Hot Spot but I think in a better way, that does go toward establishing the brand of Get in the Hot Spot in the most positive way. I like it a lot, Annabel….I am pulling for you and will be watching this space and thinking of any other way to help you! I hope you get enough money to go, I am trying to go too. Thanks for visiting and leaving a comment NS:) I hope you make it! Sponsoring you to go to BlogWorld is one of the best investments a company could make. With your excellent communication and successful trakc record in marketing, any company would get far more than their money’s worth – there’s no doubt about that. Love your gutsy approach – I can’t wait and I am sure your other subscribers can’t wait to see what the outcome is, who rises to the occasion and all that!!! Thank you for this wonderful opportunity to invest in you and this fantastic opportunity, Annabel. As your number one ‘Fannabel’, I love the chance to sow into the growth of your blog and business. You’re the real deal. The business case you propose above would shine in any of the board rooms I work in. Well done! It’s the best $50 I have spent for a while and I look forward to sharing in the benefits you reap. Love being on your team, Annabel. You’re a winner who is definitely going places. Your friend, colleague and fellow Centurion! Thank you so much Robin. My big hope is that a big company like Qantas or VAustralia will donate flights and that all the money readers have dontated will go to charity so everyone wins. I truly believe if I can grow my blog it will help all Australian bloggers and Australian tourism too because it puts it on the map for millions of blogging business people and entrepreneurs. I’ve actually met two people who’ve moved to Australia from the UK and the US after reading my blog (I used to write about emigrating) and another family is moving here soon. Incredible but true! I’d like to write more about travel on the blog (and my readers also want that) and help do my bit to keep the Aussie tourist industry healthy:) Networking is essential top blogging success and I’d love this amazing chance to meet so many bloggers of all experiences. Let’s see who’ll come to the party. 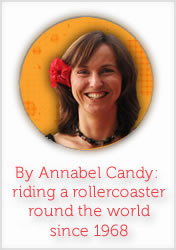 This is such a fabulous idea Annabel! Best of Luck. I’ll keep my eyes peeled for possible sponsors. Great concept and as Robin says, your business case makes donation a no-brainer. I’m sure a smart company will grab this opportunity – such a small investment for great return. I so look forward to reading all about your experience – both getting the sponsorship and your experiences at the Conference and Expo. Meantime, I think I’d like a Coke. In fact, I may just pick up a 6 pack next time I go to the store. Maybe a pizza too. Coke and a pizza. Mmmm… scrumptious. Annabel, I love this. Good on you for putting it out there – most people would be too scared to even think it, let alone suggest it out loud. I have forwarded this on to a contact of mine who works in the corporate travel industry… will let you know if I hear anything back. Well done Annabel! When we are open to receiving and we ask… we do generally receive! I hope you get the money! Wishing you the best in this endeavour. Blogworld will be fantastic!!! Go girl! Thank you so much Helen for your vote of confidence and appreciation:) It’s amazing to have your fabulous support. You certainly know how to win business and influence people online! You have my full support, I took your recommendation and spent my $25USD towards your fantastic adventure. Thank you for such excellent content and wanting to go overseas to learn how to deliver even more for us all. Hi Tony, thank YOU for supporting me. I know the info will be top notch but I’ve also learned that networking is a must in this business so it’s a great opportunity for that. I so appreciate your help. Great idea Annabel! Looks like you’ve already got some money pouring in. As they say, “ask and you shall receive”. It’s going to be fun watching this happen for you. What an adventure! I love bold people. It’s called doing what it takes. Good luck!